We are excited about our sweet corn experiment. Ken brought back some seeds from the US in February and we planted them in our garden this past spring. 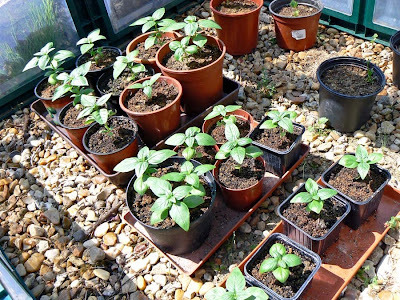 About three quarters of the seeds came up and they seem to be doing well. The corn is not quite as high as an elephant's eye. Yet. We've noticed that the feed corn growing in fields around us is just about at the same height as our sweet corn (about a meter tall), and that's kind of encouraging. I know corn likes water, so we've got to make sure to give these a lot to drink. Sweet corn is kind of an exotic thing here in France. French people tend to think of corn as animal feed. In fact, most of the corn grown in France is grown for feed. When they eat corn, it's usually in a salad, and when they buy corn, it comes in cans, rarely on the cob. And our basil is coming along very well. Ken spent a good deal of time on Monday morning weeding around these stalks. 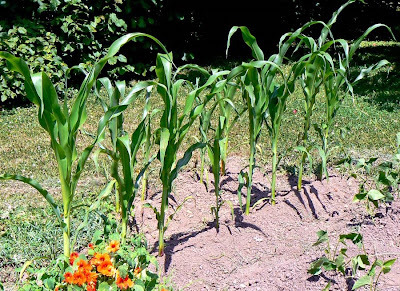 It sure would be great to have a few ears of crunchy sweet corn to eat later this summer! And the basil that I've grown from seed is doing well, too. It loves the sunny weather, of course. I'm looking forward to tomato, basil, and mozzarella salads, along with a lot of pesto sauce for the freezer! We are so happy this year to have a regrowth of cilantro, or coriander, from the plants that keep self-seeding themselves in what used to be the herb garden, along with a great mini-crop of spring onions. Ken brought the spring onion seeds back from the states in February, and they've grown wonderfully. 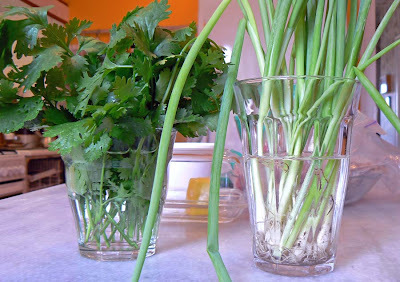 Sunday's harvest of cilantro (left) and spring onions (right). Since we love to cook Asian and Mexican foods, both of these ingredients are welcome in our summer garden. It's hard to find them in supermarkets out here in the country. Sometimes we find some cilantro, fresh or frozen (gasp!). But it's very rare. So now that we know we can grow each, depending on the year, depending on the weather, we are very happy boys. 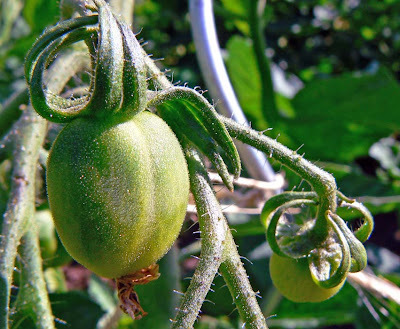 This is the second year we've tried to grow the famed native American fruit that is related to the common tomato. Last year the weather sucked and we got a late start and the plants didn't do anything. After the blossom fades, a paper lantern appears. This year, the seedlings were healthy and strong, and the plants are going gangbusters out in the garden. Now we have a whole bunch of blossoms, and the fruit is starting to set. 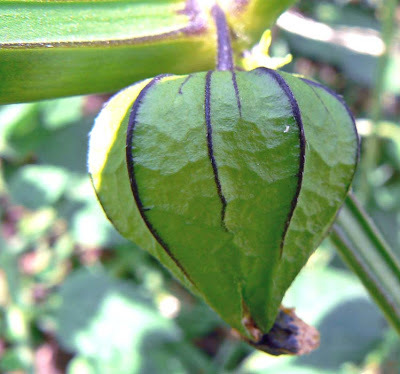 One of our tomatillo plants. They get very large. So we're hoping for a good crop with which to make some good old southwestern salsa this fall. It all depends on the weather from this point forward. As the fruit matures, we'll certainly keep taking pictures and posting them here. 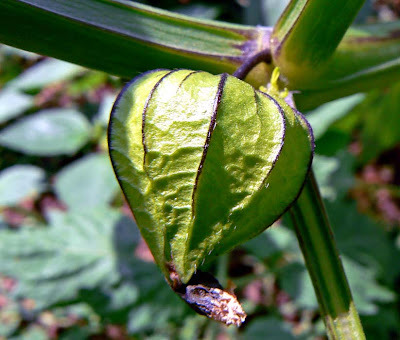 Inside the lantern, the fruit grows. 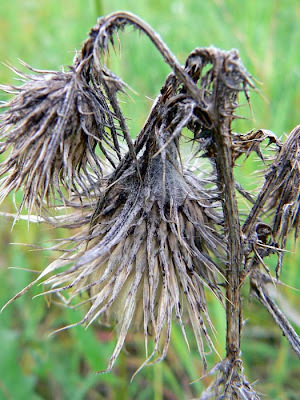 When the paper browns and tears, it will be time to harvest. The deck work is done. Now we're cleaning and performing the water test. 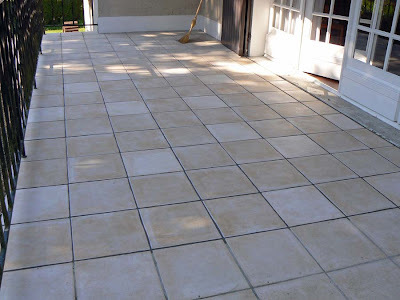 Once the old tiles were cleaned, the match between old and new is even better. So we're pretty happy about that. All the middle tiles have been removed. Down to the original surface. I still have half the deck to clean, but I've been watching tennis on tv and moving pretty slowly. We did pour some water on the new part of the deck and the puddling problem is pretty much gone. There is still, however, a little water incursion in one spot. We need some rain to see how bad it will actually get. A leveling undercoat was put down. In other news, we got our taxes done and submitted on Thursday. Nothing like waiting right up until the last minute, is there? And we need to head over to the bank to pick our our new ATM cards before our old ones expire on the 30th. The new tiles, grouted in. We also got the forms for our carte de séjour renewal. Ken's going to call the préfecture to ask them about the ten year cards before we actually send the paperwork back. This will be our sixth annual renewal, so we've been here long enough to qualify for the ten year card. We'll see how that goes. Also called "Merci Jean-Luc" for reasons that will become clear. At this point in the afternoon, we were all full of couscous, goat cheese, and our dessert of lemon tart that I made earlier in the morning. I didn't get any photos of that. It didn't last long. And we all had coffee. Fortunately, those who were driving were very responsible and stopped drinking in plenty of time so as not to be hazards on the road. The rest of us stopped well before dark. On Tuesday we welcomed our Australian friends from Preuilly, Susan and Simon, our neighbors Jean-Luc and Starr, the tile guy Jacques, and our house guest CHM, for a couscous lunch in our back yard. And here is the video proof of the fun we had. Much wine was consumed. Like that's not obvious. There was an amazing mixture of French and English. Wow. The weather was great, too. So I owe you a couple of "part two's" don't I? They'll be coming along. 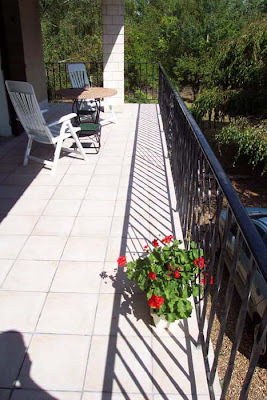 I've mentioned the problem we have with our terrasse or deck, I'm sure. 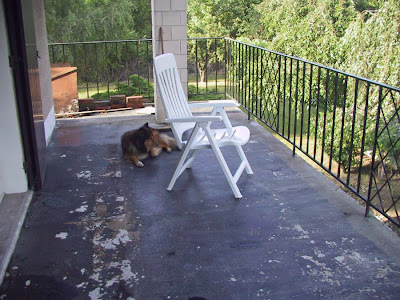 But here's a recap: when we moved into the house in 2003, the deck was a mess. 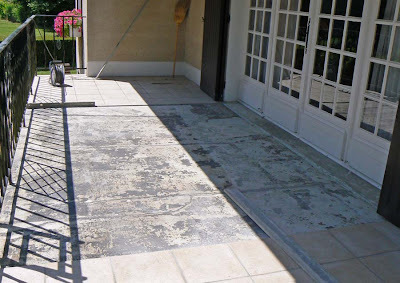 The concrete deck surface had been coated with a messy black tar in an attempt to seal it. On top of the tar was a layer of green astro-turf carpet-y stuff. The deck before we cleared it (2003). That, in turn, was covered with several sheets of plywood, several rotting tarps, and some bricks to weigh it all down. This whole mess was soggy and moldy, and the plywood was coming un-plied. And the deck still leaked when it got wet. We found this out after we dumped all the crap and washed the deck surface down. It leaked right into the garage below. 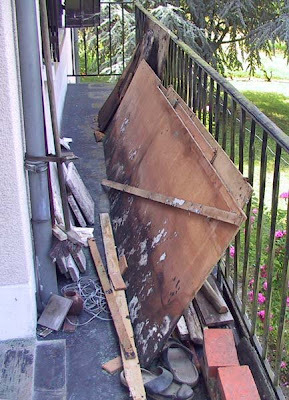 Some of the deck debris (2003). 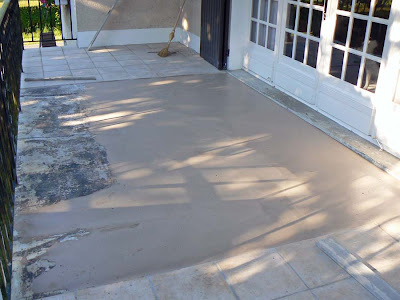 Within two months of moving in, we had the deck re-waterproofed and tiled and thought that the problem was fixed only to find out, the next time it rained, that water collected in a puddle in front of the door that opens onto the living room. We tried to get the guy who did the tiling to come back and fix it, but the job was done "under the table," we paid him cash, and he had no intention of coming back. Some of the astro-turf in a pile (2003). We've lived with the puddle problem now for nearly six years. And since we had higher priorities for capital investments, we just resigned ourselves to sweeping the water puddle off the deck every time it rained. The black tar stuff and the late Miss Collette (2003). A few weeks ago we were having drinks with friends who routinely work with contractors and they mentioned to us that they know a great tile guy. So they hooked us up with him and we showed him le lac Terrasse. 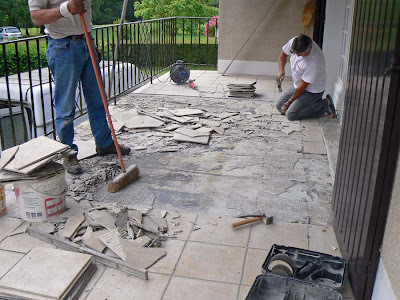 He gave us an estimate for breaking up the problem area and re-tiling it and we said ok. The building store where we got the first batch of tile in 2003 still carries the same stuff, so thankfully we don't have to have the whole deck re-done. The match between the six year old batch and the new stuff is pretty good, at least good enough for us. So the work started on Monday. So yes, I promised you another video of the vegetable garden. And here it is. I am not responsible for, well, ok, yes I am. Ken and CHM both say that the me you see in this video is not the real me. I wonder who else it could be? Looks like me to me. What do you think? I must say that, at the beginning when I say that "we are the twenty one June," well, that's just me mixing up English with French syntax. As I always say, I'm illiterate in two languages. I must also say, if it is not evident, that a few glasses of wine were consumed just prior to the making of this video. And, as if that's not enough, I took the camera with me on my walk with Callie in the vineyard. You may well see the resulting video tour of the vineyard over the next few days. Our thirty-seven tomato plants are all doing very well. Most are covered in blossoms and many actually have tomatoes. I planted so many because almost every seed I planted came up. I couldn't bring myself to toss the extra seedlings and I planted them all in the garden. So, of course, I thought I'd share. Photos, that is. These may be plum tomatoes. I have no idea which plants are of which variety. I took no special care to label them. I do know what there should be, however. As the fruit grows and ripens, things should be come a little more clear. 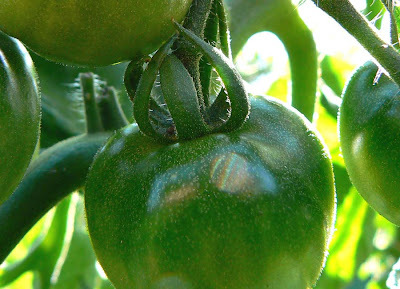 For example, there are cherry tomatoes, beefsteaks, super beefsteaks, fourth of July, yellow tomatoes from our friend Harriett, plum tomatoes, tomatillos, prudens purple, stupice, black cherry, ace 55, and rutgers, among them. We are hoping for a good crop this year for sauce and freezing. I'm pruning them based on the method described by French food and garden maven Jean-Pierre Coffe. He says that, in addition to constantly pinching out the suckers, one should pinch out the top of the plant once it's got three sets of blossoms. Also, you should allow the two lower-most suckers to develop, but pinch out their growth once they've each got two sets of blossoms. By doing this, the plant diverts its energy into the fruit rather than into growing more stem, leaves, and setting additional blossoms. So this is what I'm attempting to do. It's amazing how the suckers appear nearly every day. It's almost as if you can sit and watch them grow. Cherry tomatoes? Only time will tell. Of course I will update you as the garden progresses. And, as promised, we'll do another video garden tour very soon. Happy digging! The surfinias (trailing petunias) that we planted in the kitchen window box back in April are doing very well. We now have a brilliant box of color on the front of the house. 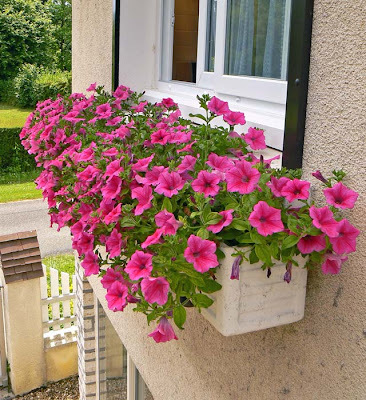 Summery flowers in the kitchen window box. Summer arrives officially this weekend, but we've been enjoying summer-like weather for most of our spring. And Sunday, being the summer solstice, is also the day for la fête de la musique (summer music festival) all over France, as well as in many other countries. We're having a very successful year so far for garden greens. We've harvested blettes (Swiss chard) several times already, and the crop keeps on growing. Ken also picked a whole mess of mustard greens and cooked them down a few days ago. We'll be batching them and freezing them soon. Adding Swiss chard to the pie shell. The latest chard harvest went into a tart on Thursday. 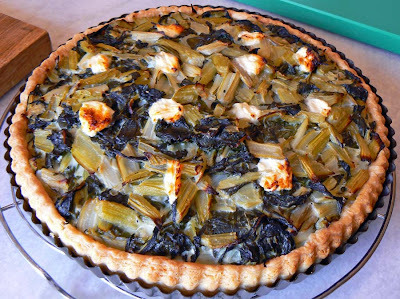 We made a chard tart a couple weeks ago which was very much like a spinach quiche, only with chard in place of the spinach. It was very good. Recently, however, I got an idea from Clotilde at Chocolate & Zucchini for a different kind of tart with less egg and more greens. I altered the recipe liberally, so let me describe it for you. I started with my standard pâte brisée (short crust) which I blind-baked, as usual. Small dollops of tangy Belgian cheese go on top. I prepared the chard the day before by separating the leaves and the stems, then cooking the chopped stems first with some onion, garlic, and olive oil before adding the chopped leaves. I also added a bit of white wine to the greens while they cooked. Once done, they went into the refrigerator overnight. 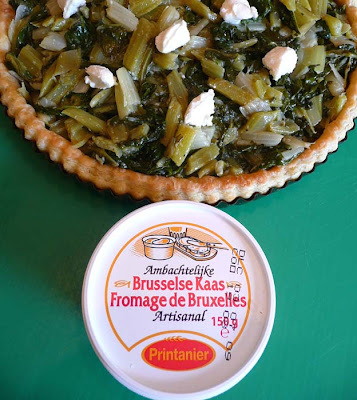 The only reason for this was to save time by having the greens already prepared when I was ready to make the tart. While the crust was baking, I toasted some pignons de pin (pine nuts) and chopped them finely. They got sprinkled into the pre-baked pie shell. 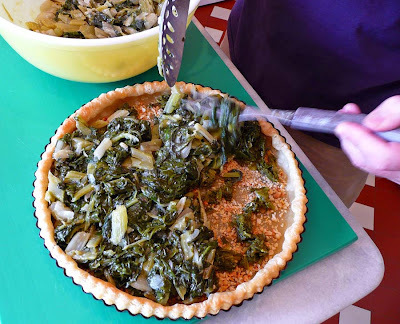 I put small dollops of Ken's cooked mustard greens into the pie shell as well. Mustard greens are very tangy and they add a bit of depth to the flavor of the sweeter, milder chard. Next, I tossed the cooked Swiss chard with two beaten eggs until it was evenly coated, then added it to the pie shell. I put a few dollops of a soft and tangy Belgian cream cheese (thanks Martine and Christian!) on top and put the whole thing in a medium oven for about thirty minutes. The result was not only beautiful, but delicious! We ate it as a main course for lunch with a local red wine. Thanks to CHM for the photos of the pie-in-the-making! I've never been to a pride event in France. But, like in the US, June is the month for events all over the nation, and June 27 is the parade day in Paris for those of you who are in town. I'm sure it will be very entertaining! The old flags dusted off for a photo. I used to fly both of these flags from our house in San Francisco. 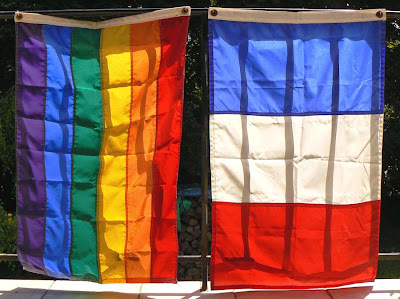 I put the rainbow flag out during the month of June and the French flag out during July. We don't fly them any more since moving to France. People here seem to be much less into these kinds of symbols, at least out in the countryside. And you normally only see the national flag on government buildings and in parades. Oh, and during international sporting events, of course. Our garden is humid enough to provide a lovely home to all manner of fungi. Some of the mushrooms that appear in the yard are edible, although we've never felt comfortable enough with our mycological skills to actually consume any. There are morels, we think, and another mushroom variety that's pretty large and white and that friends of ours actually harvested and ate (they survived). The first year we were in the house I cut those white ones down with the lawnmower, an act that brought tears to the eyes of one of our neighbors. But we still won't eat them. 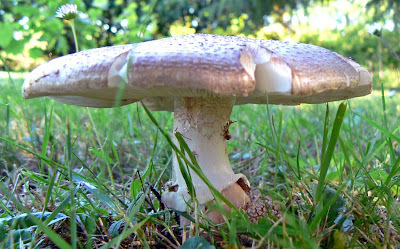 There are also many rather nasty looking varieties of mushroom that pop up here and there around the garden. When is a mushroom a toadstool? Go ask Alice. This particular specimen appeared earlier this week beneath one of our fir trees. I decided to take its picture before I puréed it with the lawnmower. 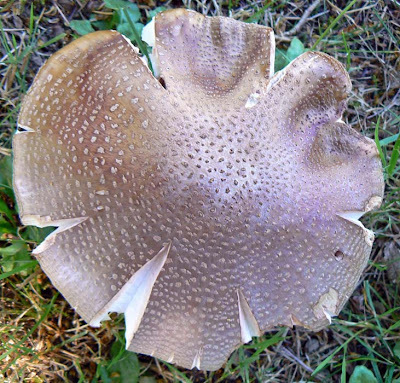 The closest match I can find in our Larousse mushroom guide is called Amanite rougissante (amanita rubescens). The guide says it's edible, but only well cooked. We, however, won't be finding out. During the summer months we frequently see hot-air balloons flying over the house. They come by early in the morning or early in the evening, depending on the weather. And every dog for miles around barks at the balloon. Callie is no exception. I took this short video a couple of days ago. While shooting, Ken came back from a store run, so I tried to get Callie to stop barking and go see him. She started to run to see him, but the pull of that hot-air balloon was too much, and she ran back to continue barking at it. She also barks at the moon, but it doesn't move out of view quite so fast. And recently, she's taken to barking at the sun when she sees it behind light clouds. Crazy dog. Gosh, my hair is getting long. Time for a cut, I think. On Sunday, the rain came back, but only lightly and it didn't get cold. We've got our fingers crossed for today since we're expecting company for what is supposed to be a cookout. I'll let you know how that goes. 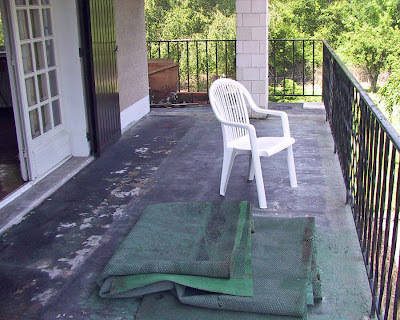 I often refer to our "deck" in the blog. Some of you have been here and know what I'm talking about. 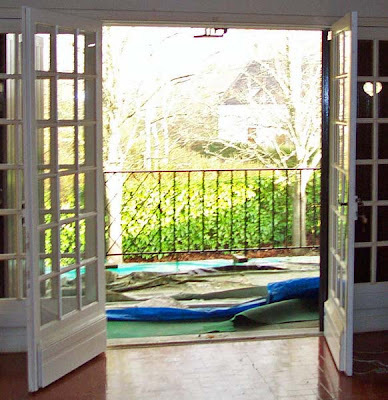 But for those of you who haven't (yet) been here, the deck is just off the living room. Our living space in the house is on the floor above ground level; it's called the first floor in France, but in the US it would be called the second floor. So here's a little video that shows what we see from the deck. Maybe I have just a little too much time on my hands? 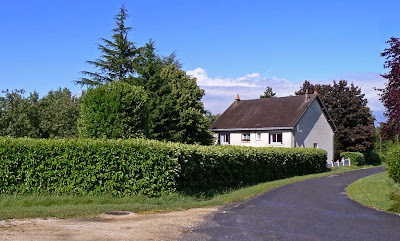 In June of 2006, Ken and I took a short trip up to Normandy with our friend Sue who was staying with us at the time. We stopped in the small town of Carrouges to visit the château. 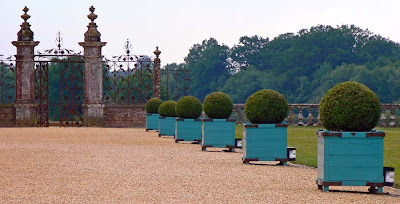 Planter boxes at the Château de Carrouges. That's what Ken calls it. That's not what happens. Let me explain. 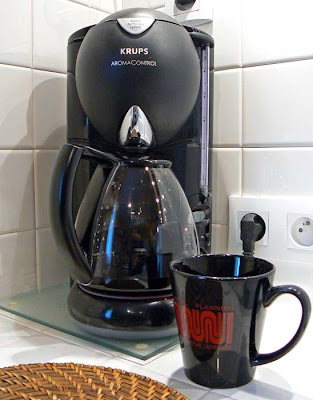 When we have coffee in the morning, we make a pot of automatic drip coffee. I don't drink mine fast enough, even when I only take half a mug, and it gets cool or even cold before I can finish it. So, I pour the cold coffee from my mug back into the pot, then refill my mug with hot coffee. This grosses Ken out. He says it's just like spitting in the coffee pot. I beg to differ. Besides, we've lived together for twenty-six years. Enough said. I, of course, see nothing wrong with this practice. And let me be very clear: I only do this when it's just the two of us at home. I NEVER do this when we have house guests, nor would I do it at someone else's home. That wouldn't be right. But when it's just us? Doesn't seem like a problem to me. If you've been reading here for a while, you know that our house is part of a tiny hamlet outside of town. There are nine houses up here at the end of our road on the heights above the river, just where the vineyards begin. Red roses at the end of our road. Four houses of the nine are currently occupied full-time. One is temporarily empty because its last occupant recently passed away (he was ninety-six years old). 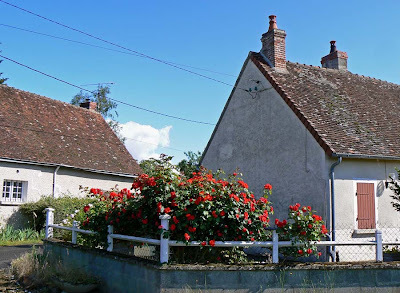 The others are vacation houses owned by people who live in and around Paris, except for one which is owned by people from Blois, about thirty miles north. 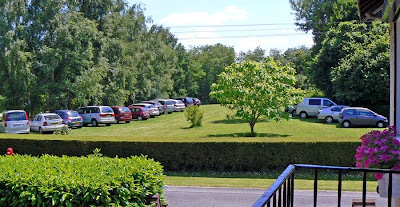 What should now be a familiar sight: the back of our house. It's a quiet place, but there's always some activity. Many neighbors have gardeners who come and work for them. Others (like us) do their own gardening. Some of the elderly neighbors have health care providers coming by daily for therapy or injections. A couple of our neighbors have regular cleaning ladies. Then there is the constant traffic of tractors as the grape growers prune, spray, or plow up weeds. Sometimes military jets zoom overhead. Often, in summer, there is a hot-air balloon or two floating by. The bread lady comes by five times a week, and there is a butcher and a frozen foods vendor that drive by once a week. 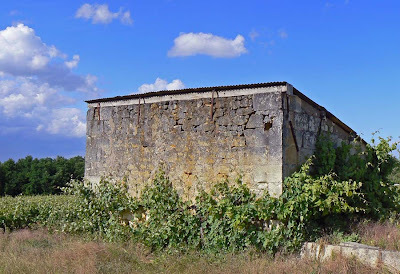 A stone storage building in the vineyard. And there are always several cars a day whose drivers are lost and end up turning around and going back when they get to the end of the paved road. Sleepy hamlet, hive of activity. I know you've been waiting for it. So here it is. 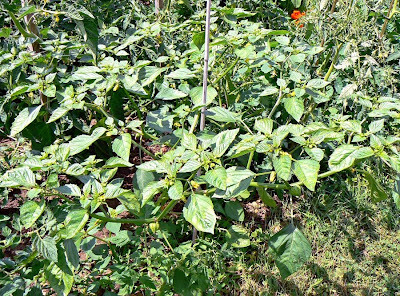 The June Vegetable Garden Tour! It's still early in the year, but here, for your viewing pleasure, is a sampling of the vegetable garden so far. And turn on your sound 'cause there's a little narration. My apologies if you can't see everything, but compressing the movie for the web makes it smaller. The eggplants are still little, so they're hard to see. They should get much larger and lusher as the next few weeks go by. 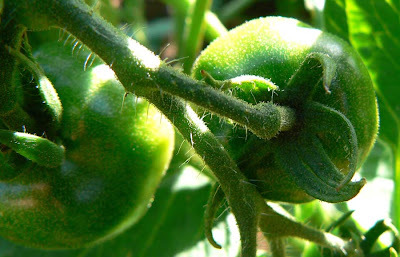 We've already got some tiny tomatoes, and most of the tomato plants have blossoms already. If the weather cooperates, we should have a good crop starting in July. After I made the movie, I went back and watered everything. It looks better wet than dry. Oh well. This makes me think that I should do an update video in a few weeks. What do y'all think? Well, my well, actually. The days this spring have more sunny than not, a condition we welcome with open arms. The garden is loving it, the dog is loving it, and we are loving it. 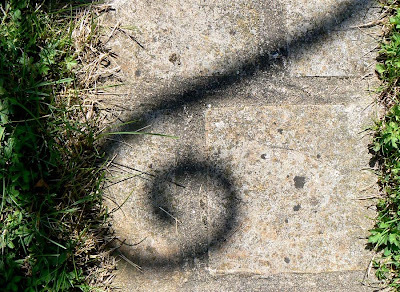 Our real fake well casts a shadow on the walkway. We've both been to visit the doctor for our twice annual checkups. There is nothing worrisome to report, thank goodness. And there's even a bright spot. I asked the doctor about colonoscopies (thank you Katie Couric), since I will turn fifty this year. He told me that they're not routine any more and that unless you have a family history of colon cancer, or some troubling symptoms, you don't need one. Instead, there's a new test that's done using a stool sample. So much less invasive, so much less costly, and while it's still a relatively new procedure, he thinks it makes much more sense. And so do I! I should be getting a letter and questionnaire in the mail sometime in the next six months telling me all about it. Right along with my letter from the A.A.R.P. If they can find me in France. Now aren't you glad I told you all of that? But they still put up a parking lot. Our neighbors' family had a big party over this past weekend (it was a three-day holiday weekend). They come from miles around, mostly from Blois, some from Paris, and some from places like Lille and Geneva. This is a common sight from our deck during the summer months. They had put up a big tent with tables under it for the meals, did a lot of bbq'ing and eating and dancing and playing. Our neighbors' kids are all in their forties and fifties, with the grandchildren and great-grandchildren ranging in age from newborn to their twenties. We were invited over for drinks on Sunday afternoon, and it was fun to get reacquainted with those of the kids we don't see very often. They're a very nice and generous family, and have been warm and welcoming toward us for the past six years. The parties last long into the night (we know, we've been to a few), but we hardly ever hear them! May and June are high tick season out here in the French countryside. And, since Callie loves running through the tall grass on her twice daily walks, she comes home with many of the little buggers hidden in her coat. Sometimes we see them crawling on her white fur before they attach. We can pick them off of her easily and flush them down the toilet. But often, the ticks attach and bloat up as they feed. Yuck. 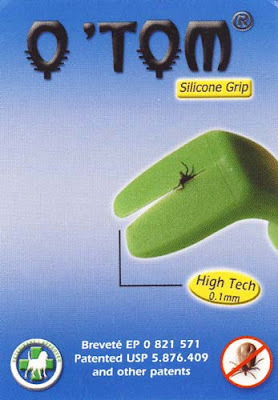 When we find an attached tick, we use a little tool that the we got at the vet's to pull it off. It's the greatest thing because the tick comes off whole, head and all. Nothing gets left behind. No fuss, no muss. And the dog is used to the process and remains calm. 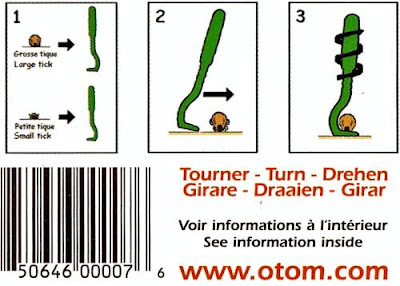 Instructions for using the tick tool. Of course, we use Frontline every month. We've never seen a flea on Callie (nor Collette before her) since we started using Frontline. And as for ticks, well, it doesn't keep them away. Instead, it poisons the dog's blood and kills the tick as it feeds. The tick then drops off the dog, dead, unable to reproduce. The Knave of Sticks outwitted the ticks: Frontline settled the score. Dry. It hasn't rained in a week and the garden is finally getting the chance to dry out a bit. We had 96 mm (just under four inches) of rain during the month of May, which is well over the local average of about 60 mm. Things were starting to get a little soggy out there. Some of last years plants, still standing after winter. Right now we're having a series of crisp, sunny, and dry days. Heaven! But this being France, we know the rain will be back soon enough. Still, the garden and the plants are enjoying the respite. Today is our anniversary. Or what we count as our anniversary. 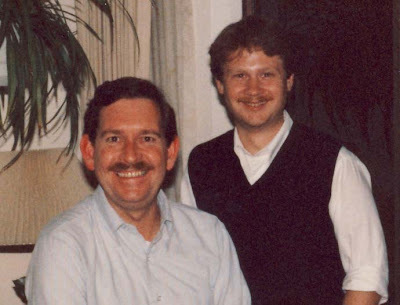 On June 1, 1983, Ken and I signed our first lease together and moved into an apartment on Capitol Hill in Washington, D.C.
Ken (left) and me in 1987, just after moving to California. In 1986 we loaded up the truck and we moved to Beverly. San Francisco, that is. Fog. Earthquakes. We stayed nearly eighteen years there, had what passes for careers in our lives, then cashed out to move to France in 2003. And here we are. Twenty-six years, nine cars, five apartments, three houses, a swarm of earthquakes, a tank of fish, and two dogs later, here we are. And here we'll stay. For now, anyway. I think I'll open something bubbly.